The presentation by Rob Birza in Bureau Amsterdam is part of the international group exhibition From the Corner of the Eye, which takes place this summer in both the Stedelijk Museum and Bureau Amsterdam, concurrently with the Gay Games Amsterdam, 1998. (1) Rob Birza has shown his work in a "gay" context once before. Five years ago he presented a series of watercolours at the Stedelijk Museum as part of the annual Commitment exhibition organized to mark World AIDS Day. Birza's work, like that of the other artists in 'From the Corner of the Eye', does not allow itself to be characterized by a specific "homosexual" style, iconography or aesthetic. For artists in the 1990s, their sexual identity - in this case, homosexual identity - is not something which exhaustively defines their artist production. For many artists, sexual orientation is just one of the many significant aspects in their work, but is an aspect which is often ignored in exhibitions and art criticism. From the Corner of the Eye offers an image of contemporary visual arts, seen from a "queer" perspective. In this exhibition, it is hoped that the homosexual gaze will sometimes emphatically present and at other times will disappear into the background. Light, and the possibility or impossibility of seeing, is a motif which has begun to run like a thread through Birza's oeuvre. Three years ago, in India, he made a series of paintings which used the solar eclipse as their theme. 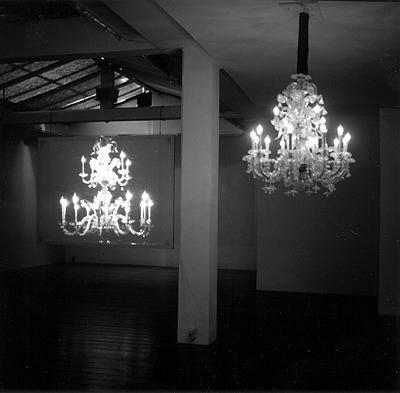 He also incorporates blinking neon tubes or designer lamps from the 1960s in his installations. Sometimes light is given a metaphysical dimension; on other occasions Birza refers to the banal lighting effects in a disco. Although painting is always the point of departure for Birza, over the last few years he has begun to present himself less and less as a painter pur sang, and more and more as a director of three- dimensional presentations. These "paintings which have escaped from the wall" have increasingly taken on the nature of "environments" which stretch out over the floor, walls and ceiling. It is therefore not surprising that Birza has also become active in theatre. Last year, together with choreographer Karin Post and stylist Ruud van der Peyl, Birza created the theatre piece "All Cinderellas ready for take off," for which he designed both the sets and the lighting. Digital Treble Discoveries-Unplugged is a very personal work which balances on the borderline of what is extremely private and what is public, between the sensitive and the sentimental, the sincere and the artificial, the exalted and the banal. At first sight he seems to be playing a game with the cliches of "gay art" and sending up the idea of homosexual iconography. But there is a whole other realm to be found under the level of irony and ambiguity, one of intensity, alienation and intimacy. 1. Participating artists in From the Corner of the Eye are: Tariq Alvi, Rob Birza, Lukas Duwenhögger, Nicole Eisenman, Arnoud Holleman, Jochen Klein, Matts Leiderstam, John Lindell, Catherine Opie, Ugo Rondinone, Collier Schorr, Wolfgang Tillmans, Albert van Westing en Cerith Wyn Evans. 2. “Ik heb niets te verbergen,” interview with Rob Birza by Cornald Maas, De Volkskrant, May 10, 1996, p. 20. 3. “Mooi bestaat niet meer,” interview with Rob Birza by Cathérine van Houts, Het Parool, June 27, 1992, p. 37.